Welcome to whatever Wednesday…here we’re sharing projects we are working on. It used to be only about UFOs…now it’s about whatever you want to share! For me….I’m STILL working on the house. I’m cleaning still and organizing. One of the main things I’ve been doing is finding things that have been driving me crazy and fixing them. Sometimes it’s such simple things. First up…my kitchen broom closet. I keep the cleaning supplies at the top so they are away from the kiddos..the bottom is for mops, brooms and dust pans. See that little black hand held vacuum hanging to the right? Well that has spent it’s entire time at this house on the floor. Half the time the Oreck vacuum was on top of it. It was always in the way and getting kicked aside. I cleaned the closet out thinking I just needed to clean the closet but nope. Even cleaned, there really wasn’t a place for it. I said something to Hubby. One eye bolt later and LOOK…he had the idea to hang it. AH…why didn’t I say something sooner? The next thing I am fixing…SPICES. Oh my word. I have NEVER been able to do spices right in my entire life. Please tell me this can be solved. We purposely had the cabinet makes MAKE a cabinet that had a way to organize spices…Still I have this…. It’s not working for me. I’m so sick of this mess. I ended up going to Amazon and found these spice jars. I ordered a set and when they get here, this is going to look MUCH better and be more functional…scout’s honor. The way it is frustrates me…and slows me down….and beyond all that, I want it nice. These are going to be labeled with spices I regularly use…the odds and ends things will go in the other cabinet. I think I’ll get a step up rack for there too. Little by little it will all happen. All of this I’ve wanted to do for SO LONG. Why do I wait? You’ll find me back here next Wednesday….I’m hoping my spice cabinet problem is no more by then….and I’ll be onto the next thing that is driving me crazy. This entry was posted in Uncategorized on April 11, 2018 by Jo. Hmmm, that eye bolt your husband put in for your little black vacuum is a great idea!! Now, think about what items you touch the most, and move them the closest to the opening of the door. For instance, if you use the dustpan a lot, move it nearer the left side of the closet. This way it is within close reach of your left hand, assuming you open the door with your right hand. Or perhaps you want the childcare children to learn how to use the dustpan, or to retrieve it for you. Put it on a low hook on the door, maybe get one of those dustpans with a small brush that snaps into its handle, and they could clean up a mess themselves. Now and then I need a different spice from “the other cupboard” but it is easy to use and return to the usual cupboard. 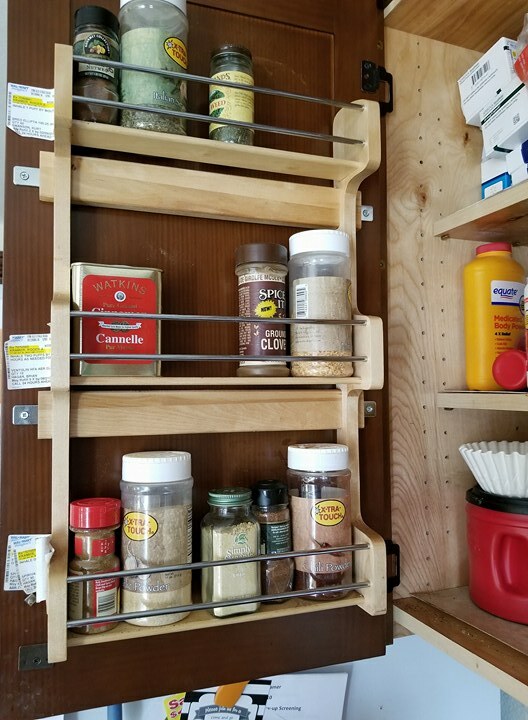 I don’t cook or bake for a large group anymore, but it is much easier to find spices in my cupboards using this method. Something must be in the air. I am doing the same thing-going from spot to spot cleaning and pitching. Even made my husband join in. It is called spring cleaning. I know most people do not even know what it is but, every spring the curtains got washed or changed, mattress vacuumed and turned, bed skirt and comforter changed to lighter ones, cupboards cleaned, Windows washed and screens washed and winter clothes put away and spring and summer came out to play. Then it was repeated in the fall. Usually it was done in late March of early April before the gardens were started and then there would not be time for deep cleaning. I may not do it as thoroughly as before, but it still is a process that call to me. Honestly, I’m getting a bit panicked. I am watching my three month old grandson now because his mama went back to work. Now I feel like I don’t get anything done LOL. No spring cleaning, and no gardens have been put in yet. Yikes! I’m managing to get some sewing and knitting done, but nothing like what I need to be getting done. Still, my grandson is worth it. I agree on separating the cooking and baking spices. I have also alphabetized mine. I know, it sounds a little compulsive, but now I know the general area to start searching. Just have to put the bottles back where you took them out. All my spices are in a pull-out drawer in alphabetical order. I put two long slats of wood horizontally in the drawer to separate the rows. All different size containers fit there. It works great for me and even though my kids have always tease me about being obsessive about it, my married daughter has found that the system works well for her too. And I’m not enough of a cook or Baker to separate the spices. How do you motivate yourself to clean closets? There are 3 closets and a laundry room waiting for me.